Weight numbers are a funny thing. I can't think of how many celebrity juice rags I have seen where the front is emblazoned with "THIS CELEBRITY TOPS 250 POUNDS!!!" I happen to think I would look pretty fantastic at 250lbs - not that I don't look pretty fantastic right now at 291lbs. I sometimes play this guessing game with people when we are talking about weight. I will tell them I won't be insulted, but I want them to guess how much I weigh, and no guess will hurt my feelings. They usually guess in the very low ballpark. I usually get 230-250lbs, and then shock people by revealing that I weigh closer to 300lbs. I guess the point is that people get so obsessed with numbers. I have never understood it. I see people who are on the "fluffy" side (I'll say 180-200lbs) get all in a panic, calculating and figuring to see if they are over the 1/3rd or 1/4 "rule" for their horses, and panicking if they are coming close to 250lbs. The fact of the matter is that it is hard to paint every rider with the same brush based on the numerical figure of their weight - equally so, you can't paint every horse with the same brush based on the numerical figure of their weight. The 1/3rd or 1/4 "rule" is a nice guideline to follow but realistically, it doesn't work that way for every horse. 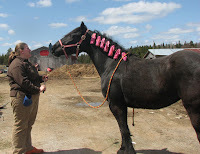 Further, people are often guesstimating with a horse's weight, particularly when they are just guessing by sight or using a weight tape. I have mentioned her weight before, but how many people, if I didn't tell you that I had her body weighed (pre-necropsy, sadly), would believe that this mare, in pasture condition was 1290lbs? A weight tape would have measured her at much less, I am certain. So I would hesitate to use a 1/3rd or 1/4 rule (or a 20% rule or whatever other rule they have out there) unless I knew my numbers for certain. 1200lbs can look as different from horse to horse as 250lbs looks from rider to rider. The immediate thought, going by the rule of rider's weight compared to horse's weight, is that anyone over 300lbs probably needs a draft horse. The reality is that often, full drafts are just not suitable. Certain full drafts would be perfect, but not every draft is cut out to carry that much weight, particularly if they are show hitch bred. Spindly little legs probably won't hold up to much work with any size of rider, so those horses are best to avoid in the first place for anyone! However, when I am talking about "good bone", I'm not necessarily talking about the fat legged draft horse. Many stock horses have excellent bone and fantastic feet and are completely suitable, when coupled with a short back and general overall fitness for a plus sized rider. A short back carries weight better than a long back will. Many hitch bred draft horses (ones bred specifically for the high-stepping harness action that happens in the world of showing draft horses in hand) have long backs. I am not going to comment on why I think they are bred to have long backs, because this isn't that kind of blog - but the truth of it is that many have long backs, thus making them unsuitable for a heavy rider. There are many, many, MANY other factors that I also think are extremely important - including but not limited to fitness of horse AND rider, skill level of rider (good, light seat? ), age of horse, skill level of horse, fit of tack (for both horse and rider) and a variety of other things. Many plus sized riders (myself included in recent years) find themselves more comfortable on a draft or draft cross as a mount. It is true that these horses can meet the bone and back requirements, as well as often are large enough and have backs large enough to carry a larger seat size saddle that a plus sized rider would require - however, other breeds can, too. 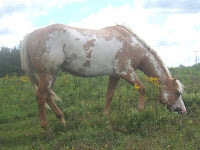 As I mentioned in another entry, my last horse was an APHA mare who carried me with no problems at all. I know there are others out there riding "non drafts" as plus sized riders and if you are one, I would be really interested to see pictures and would love to be able to post them on the blog! I am going to begin a feature entry, I think, where I share photos and the story of plus sized riders once a week (Fridays, maybe?) - so if you are interested in seeing your pictures up and having everyone oooh and ahhh over how pretty you are, drop a line to seeking(dot)sendiri(at)gmail(dot)com! Okay, so my guy is a Perch/Paint cross so I don't really meet the "non-draft" requirement. But I have ridden smaller horses (even cantering and jumping) and none of them have had any issue carrying me. (I weigh, for the record, somewhere around 200lb, give or take, haven't weighed myself in a while) But I'm also a half-decent rider (I think) and I don't tend to flop around in the saddle so I imagine that helps. :) I'll see if I can dig up some pics of me on smaller horses. My favourite lesson horse was a perch paint you lucky duck! As I progressed I was put on an OTTB who was a nutbar. I swore right then and there that I would have a draft cross of my own, felt so secure on Karma's wide back. Well fast forward 3 months and I now own an OTTB named Bear. Funny how life works out haha. I am a plus size rider, too. But, because of my age and size I find it much easier to be a plus size driver. I have a new cart and horse and I love driving around my neighborhood. Kathryn, that is FANTASTIC! It doesn't necessarily have to be riding - but continuing to be around and use horses as it makes you happy is so important. :) Would love to see some pics! I'm a plus-sized rider on a non-draft! My mare is a 15.1hh Tenn Walking Horse. She's solid built, a little chunky even. I'll email you a link to my Flickr account with pics of us riding! I ride a quarter horse/standardbred cross. His back is a little longer than I would have liked, but he has THICK legs and big feet. I obsess over the 20% rule! He tapes at around 1140 consistently, so I under-estimate and guess 1100. I bought a synthetic saddle, so with me and the tack I figure I'm around 30 lbs over or so. My vet and trainer have both assured me he is fine with my weight. Luckily, my vet boards where I do, so she has seen me on him! Before I got my draft cross I was riding a TWH. He handled my then 250lbs with no problems. My draft cross is half TWH and he doesn't even know that I am there, lol. I would love to read about what tack is better to ride in if you are a plus size rider. I have been told that western is better due to the tree spreading the weight out over a larger surface. My3Arabs, I would think a well fitted English saddle with a balanced rider would be appropriate as well. A beginner or re-rider, in my opinion, should probably go with a western saddle until they gather up their balance and develop a light seat and find their centre of gravity. This is a very interesting topic, though, and I will definitely see who I can talk to to give me a little more information, since I am definitely not a tack expert by any stretch of the imagination! Hey, I'm a girl from the netherlands and I really love your blog. I weigh a 220lbs. I don't see myself as superfat, even if some people call me that. I ride a belgian draft named Taura owned by my uncle and I've been riding her for several years now. I've been in love with draft horses since I was small, hahah. I think they have a sense of power about them, ofcourse ''normall'' horses are also beautiful and I regularly ride a hanovarian called Bessie. I enjoy horse riding alot, but because I thought I was too big, I went on the internet to see if I was. I came across a lot of de-incouraging things but then I found a ray of light amongst all the bad things. This blog. It made me feel so much better about myself and my passion. I'm six months pregnant and up to 230 pounds. I ride a 4 year old Arab Cross mare who is 900 pounds. She's fine with workouts, trail rides, etc. I can tell she does get a little tired after a a long workout in our horrible Midwest heat/humidity, but so do the big horses. I only do flat work with her while I'm this heavy and awkward. She's also been carrying me since I was closer to the 20% rule. I also ride a big 1300 lb Thoroughbred cross gelding - 16.2 or .3 and he easily carries me on all day rides. i have been riding all the bigger horses at my barn and i have been pretty ashamed of riding with the skinny girls at my barn. this blog makes me feel a lot better. i am close to 300 and i always thought that my horses would get tired faster than the other horses but thats not true. i have found that because i thought i had to be so careful, it actually made me a better rider because i am constantly listening to my horse. thanks for giving me a place to not feel so alone. glad to read about you ;-)!! I´m 42, a plus rider (240-250 pounds// 5´11") too and just bought a new horse this year. :-) A "big" (~16.0 h), stout, 3 year old TWH mare. I´ ve been very sceptical about the TWHs and their size, and ability to carry MY weight .... because my two hanovarian geldings, are 17.1 and 18 hh and really tank size! After two big back surgeries (4 screwed together spines now) I always had horrible back pain while/after riding my trotting /non gaited geldings (15.5 /22.5 years old). Test-riding on TWHs solves this problem :-), AND make my back much better. I'm an Aussie girl, heavier, 18 years old and not athletic at all, but I ride my 18 year old anglo arab with little issue. I have just bought a new saddle that fits him and me and it as made the world of difference. on my FB there are many photos of us. He was really skinny when i got him, my first horse, i'd hardly ridden apart from trail rides and now we are getting around pretty well. I've never had a professional riding lesson as such but learnt from watching and listening. if you have any ideas/criticism of Casper or i I'd welcome it as I do want to get better and lose weight. I am so tired of this subject. In the Midwest I see all kinds of riders in endurance and yes the Arab still is the mainstay. I started endurance events with a Percheron Cross at 1300# and me at #268 , I got to the point where I said to heck with it.. I am going to try it. My horse has the mind of a TB in draftbody, is stubborn and sound as they come. His recoveries are great, but I do have the sense not to ride him hard in 90+ weather. All the odd wandering eye looks or worste yet the ones where they pretend not to see you... well they will probably always be there. But the more of us heavier people enter the events the less we can be ignored. The really HUGE point here is this... Since starting to ride I have gone down to 200#. I think when you are younger you can say " I will ride endurance when I am "X" weight, but when you are up there in age and your years can be numbered.. you just sort of go.. well to heck with you all .. I have the right to enjoy the sport as much as skinny endurance riders do... so just ignore ... the ... "pipe cleaners with ears" ... Like they say.. JUST DO IT. I'm going on a trail ride in about a month and I'm terrified I'm too big and am going to face some sort of embarrassment when I get there. I'm about 5'8" and somewhere around 290. I have riding experience and I even spoke to the woman at the place (but seriously 'underestimated' my weight by about 40lbs). She told me they have draft horses and I'm fine riding one, I just want to make sure I actually can. I don't want to be turned away because of my size...mortifying!!! Do you think I'll be fine? So I just found your blog today. I love it! I'm weighing in at 266lbs right now, also built like an amazon (working on losing weight, and changing my eating and exercise habits for health reasons as I come from a line of diabetics). I don't think I'll ever plan on doing much more than trail or pleasure riding, but I'm a girl who has wanted a horse my whole life. While you say that plus size riders don't have to ride a draft horse, but what if I DID want to ride a draft horse? I know you're not saying I can't ride a draft horse either. I just really like the way they look, and their dispositions, particularly gypsy cobs, shires, and drum horses. What are some good breeds as a general rule of the thumb? I know it still comes down to the individual rider, and the individual horse. What should I be looking for in my future horse companion? My advice is look at the horse not the breed (Unless you want to get into breed showing). You're better off with a horse that has the temprement and training to match up with you, and make sure it has good conformation. Ideally get someone who knows their horses to come with you as a 2nd opinion and get a vet check. Some breeds are classed as being more highly strung, athletic, calmer, intelligent etc however there's always exceptions to the rule so look at each horse as an individual. I am 281# and I ride Corrolla horses, a nearly pony sized breed of NC wild horses from Spanish stock. They have short legs, short backs and the tallest horse on the place is 15.2. The owner had zero problem putting me on a horse. I strongly suspect he chose the horse he did for disposition rather than size issues... but then he's not a skinny guy himself. It strikes me that horse people have math problems. I know this is a *little* late but I'm plus size and ride an anglo arab. We've been together almost 20 years and used to go out competing regularly. Everyone comments how good she looks for her age, she's still sound and has no apparent trouble carring me (Usually I'm the one to put the brakes on, not her!) I find all the negativity out there in the horse world (Particularly in the nameless cyberspace) rather sad. Fortunately most of my experiences with people have been good, but it's annoying when people who don't know us look down their noses. I've always been plus sized, and my second horse was an Arabian mare. She held me just fine. My horse now is a BS Paint gelding, and while he's not exactly "chunky" he is build like a freight train. He has no problems carrying me at all! Having given up riding years ago because of a back injury (not because I weighed over 200 pounds), I still love horses and applaud all of you who can get out there and ride often. Two of my friends have given up riding becaue their veterinarians told them they were harming their horses. So naturally I got a kick out of a male co-worker who asked me why a 190-pound woman couldn't ride a horse while his 230-pound brother could. Good point. This makes me feel better about being a plus sized rider. I am at 290 right now, and am afraid to ride in public, because I did not know what peopke where going to say about a big person riding a horse. I just wish I could ride more. But, don't have a horse of my own. Thanks for making this blog! I rode a grade quarter horse mare for years. Short with really great bone. We did play days and long trail rides. She never had a problem until she was around 25. I was around 340 lbs. I know have a paint draft cross and i weigh 390. I am to scared to ride now. I don't know why but that extra 50 lbs has taken my ability to ride away. I think how you ride makes all the difference not what you ride. I have a QH mare that is about 15.2 hh, an Arab/QH cross gelding that is 14 hh and maybe 900lbs. Then I have two haflinger mares - cannot tell their weight, a weight tape isn't going to read accurately on them. One is 14 hh. The other is 13 hh (Gemma). Both are stout, broad backed, good boned horses. The 13hh mare will go to a trainer this spring and I look forward to riding her. She is as broad as she is tall and I don't think will have a hard time carrying me even though I am 230 and 5'2. I bought a tucker equitation endurance saddle to fit my other horses and me, it is a light weight saddle and it puts me in a very centered balanced position for riding. My horses love it. I will have to buy an X-wide treed saddle for my shortest mare, Gemma. Thinking another tucker or a duvet(sp?) She is the shortest imp out there but while everyone else needs a medium tree she needs x-wide... She and I have a lot in common, short thick girls. I have rode all my life and have always struggled with my weight. I believe the studies on the weights horses can carry is very subjective, are people not able to carry more as they develop and work out and lift weights? Are horses the same? I am not saying load a horse down starting out with weight it can't bare but it should be able to work up to heavier weights up to a maximum for its bone and frame... to me that would be a scientific/logical conclusion. Conformation, muscle, and etc. would all factor in to that upper weight that might break them down. How much weight were these test subject horses used to carrying? Of course if they carry 20% all the time, 20% and lower is not going to be a problem for them... no work out at all. Put 25 to 30% on them and then you are creating a workout they are not used to... surprised no one has mentioned that. A long back horse is going to go swaybacked usually if worked... it would more than likely happen quicker under heavier weights. Long backed broodmares become sway backed also. Where is the common sense? Hi, I just found your blog and feel better about myself and my horse. I recently got an Appaloosa mare and she is so loving. I was wondering if you could give some tips on mounting? I know I can use a mounting block, but if I didn't have one around while out on the trails, then I was wondering what to do about ground mounting? I figured out how to keep the saddle in place, but when I go to leave the ground, it is a little difficult to do a fluid motion to get in the seat. That, and I hop up and as I'm holding onto the saddle, I feel myself pulling, and she gets off step and usually goes a little sideways. I am trying to practice everyday mounting, but I can't seem to ground mount. Any advice would be appreciated. Thanks!! I've taught my horse to park next to trees, fences, gates, rocks, picnic tables, in ditches...pretty much anything I can find to give me a little more height and her a little less. I am about 5'6" (short) and she was about 15hh when I bought her then she grew (she is estimated to be at least 16.3hh if not taller (i refuse to measure her because in my little deluded world she is only 16hh). So without a mounting block we have issues. The other trick is to lower your stirrup (but you then have the problem of training you horse to stand still whilst you shorten it). I also ride in a general purpose or dressage saddle. If you have a western saddle you are on your own as I have no idea how they work or how easy they are to shorten the stirrups once mounted. I have a dodgy hip which doesn't help matters either so I tend to always use a mounting block. I think western saddles are a little too complicated to shorten and lengthen the stirrups from the saddle. They're a pain from the ground! I'm a plus sized rider with a 15 hand APHA gelding.I'm paranoid so I have the vet check him for pain every time she's out but she always says he's more than capable of handling my 270+ pounds. He's never sore and he's more than happy to go trail riding through swamps and up steep mountain trails with me! I really do believe that it depends on the horse and not some arbitrary percentage. If a percentage were the case, how do those tall, muscular men ride horses? How do the bigger guys ride those little reiners (like the one who rode Hollywood Dunit... I can't remember his name... Tim McQuay or something???) I'd be willing to bet that a heavier rider is much easier on a horse's back than a bouncy beginner! reat blog, this could be the best blog I ever visited this month. Never stop to write something useful dude!. My son weighs 260 pounds. He has a large frame and is fit. He has noticed occasionally that a horse has seemed uncomfortable carrying him & almost always the problem has been traced to an ill-fitting saddle (Jochen Schleese is on YouTube - I can't afford his saddles, but his tips are free for the watching) . My son has done most of his riding on the quarter type mare he grew up with. Life is short - and horses are the greatest friends! It is outrageous to judge someone else's body in the first place - and to simply assume that they are not knowledgeable and concerned regarding the well-being of their horse..! Bad manners are shameful - going for a nice ride or drive with your favorite horse buddy is NOT. Weight Loss Vlog #3 - 3.2lbs LOST!